Q. Does eating eggs really increase your risk of a heart attack? A. From what we know today, here's the bottom line: for most people, an egg a day does not increase your risk of a heart attack, a stroke, or any other type of cardiovascular disease. No more than three eggs per week is wise if you have diabetes, are at high risk for heart disease from other causes (such as smoking), or already have heart disease. This is definitely not what I was told by my parents, nor by my medical school professors. Back then, we knew that egg yolks had lots of cholesterol, and we knew that high levels of LDL (bad) cholesterol in the blood increased the risk of cardiovascular disease. So it seemed logical that avoiding cholesterol in the diet made sense. Since then, however, research has shown that most of the cholesterol in our body is made by our liver-it doesn't come from cholesterol we eat. The liver is stimulated to make cholesterol primarily by saturated fat and trans fat in our diet, not dietary cholesterol. But a large egg contains little saturated fat-about 1.5 grams (g). 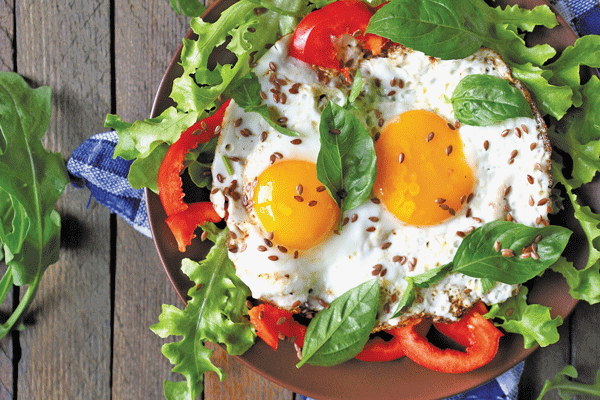 And research has confirmed that eggs also contain many healthy nutrients: lutein and zeaxanthin, which are good for the eyes; choline, which is good for the brain and nerves; and various vitamins (A, B, and D). In fact, just one large egg contains 270 international units (IU) of vitamin A and 41 IU of vitamin D. One large egg also contains about 6 g of protein and 72 calories. The evidence that eating an egg a day is safe for most people comes from huge studies-many conducted here at Harvard Medical School-that have followed hundreds of thousands of people over decades. They regularly report what they eat and all of the medical conditions that they develop. It is those studies that do not find higher rates of heart attacks, strokes, or other cardiovascular diseases in people who eat up to one egg per day. Of course, it matters greatly what you eat with your eggs. The saturated fat in butter, cheese, bacon, sausage, muffins, or scones, for example, raises your blood cholesterol much more than the cholesterol in your egg. And the highly refined "bad carbs" in white toast, pastries, home fries, and hash browns may also increase your risk of heart disease, stroke, and other cardiovascular diseases. Do I eat eggs regularly? I didn't in the past, but the new knowledge has changed my practice. I typically have a couple of eggs two or three times per week, so it averages out to less than one per day. Often, the eggs are mixed with fresh vegetables, herbs and spices, green chili, or salsa. There's whole-grain toast, with soft margarine (low in saturated fats and trans fats). It's delicious, and the best current evidence says it's healthy.